The Classic Cortina Car Club started in the mid 1980's with a small group of Ford Cortina enthusiasts in Christchurch. Classiccortina.co.nz presents an article about a specific topic. three profiles were found for Classiccortina.co.nz in social networks. Among other social networks the website is represented in Facebook, Twitter and YouTube. The web server with the IP-address 104.196.231.73 used by Classiccortina.co.nz is owned by Google Cloud and is located in Mountain View, USA. 10 other websites are located on this web server. Most of them are provided in the english language. 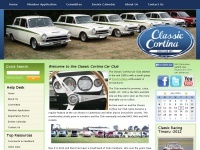 The websites of Classiccortina.co.nz are served by a Nginx server. The content management system WordPress is used. The HTML pages were created with the latest standard HTML 5. The website does not specify details about the inclusion of its content in search engines. For this reason the content will be included by search engines.